Aamina grew up in London. After completing an MA in Television Drama she worked as a script editor for the BBC, ITV and independent production companies on a number of prime-time network shows. She has been selected for various script development schemes including Arista’s Scribes program, the UK Film Council’s Blank Slate scheme and The Royal Court Theatre’s Critical Mass program. Her full length play, The Dishonoured was produced by Kali and toured in the UK in 2016, and was nominated for an Off West End Award. 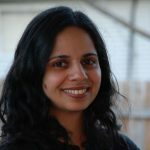 Aamina holds an MFA in fiction from the Iowa Writers’ Workshop. Her short fiction has appeared in The Normal School, The Missouri Review, Ecotone and the anthology, And the World Changed. She was a Stegner Fellow at Stanford from 2015-2017 and received a Rona Jaffe Writer’s Award in 2017.